Established in 2001 in the heart of South Kensington, it offers some of the finest crêpes in the world. 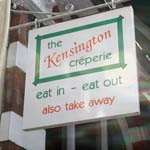 Visit our sister restaurant: The Kensington Crêperie. During very busy periods the Crêperie often extends its opening hours to 12.00 midnight. Open seven days a week with the exception of Christmas day, Boxing day and New Year’s day. We are open seven days a week with the exception of Christmas day, Boxing day and New Year’s day.